Triple Crown winner Carl Yastrzemski nearly ruined another player’s Triple Crown chances in 1960. Larry “Bo” Osborne bashed 190 home runs in his minor league career. However, with the Tigers and later the Senators, he couldn’t hold a full-time job. “Signed a football scholarship at Auburn University in January, 1953. Then signed a baseball contract with Detroit Tigers in May, forgoing college scholarship. Started my baseball career at class A Montgomery, Ala. June, 1953. Class B Durham, N.C. 1954. Class A Augusta, Ga. 1955 and 1956. Started at class AA Birmingham, Ala. 1957. 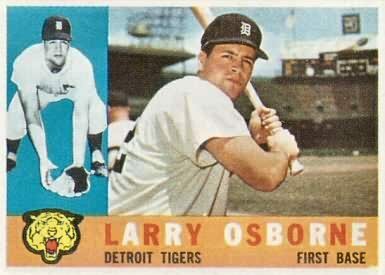 Called up to Detroit in June, 1957. Bill Tuttle CF on disabled list. Al Kaline took over in CF. I played RF. During my ML career, I played several positions. ‘Jack of all trades, master of none.’ First base was my primary position. Also played 3B, LF, RF and caught, all at the Major League level. Winning Triple Crown in 1960 at Denver was the height of my career. Beat Carl Yastrzemski for batting title last two days of the season. He went 1 for 9. I went 5 for 7.